Osborn Products, Inc. offers the 3-Wire Thread Measuring System for fast and accurate thread measurement on a variety of measuring instruments. The traditional three-wire method is the most accurate method of measuring the effective or pitch diameter of an external screw thread. Unfortunately in the past, holding and correctly positioning three wires against a thread while simultaneously taking an accurate measurement had been an extremely difficult task. Now, Osborn Products’ 3-Wire Thread Measuring System provides a simple and precise way for determining the pitch diameter for threaded parts and thread plug gages. The system enhances Repeatability and Reproducibility ( R & R ) and reduces measurement time to a fraction of the time normally taken using the traditional three-wire method. 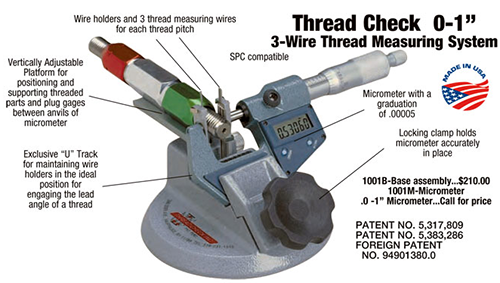 Thread Check offers specially designed wire holders and wires, base assemblies, and vertically adjustable off-set platforms that make thread measurement fast and accurate. Osborn Product's holders are fitted with certified full length thread measuring wires that meet or exceed the requirements of the ASME/ANSI B1.2, and B1.16M, thread standards as well as Federal Spec. GGG-W-366b and ISO standards. All wire holder sets include the actual wire size, NIST traceable number, and the constant required for determining the pitch diameter. Thread measuring holders are precision made to predetermined thread pitches. Thread measuring wires are held in a predetermined position by light pressure clips. The holders rotate freely on the spindle/anvil of the measuring instrument so as to engage the lead angle of a thread. Holders for finer pitches have wires positioned off center to allow for measurement at the back of a thread and closer to the shoulder of certain parts. Holders can be purchased without wires for companies that have existing wires. Wires can be easily installed. Thread measuring holders are available in a full range of Standard, Metric, and Acme sizes. Osborn Products’ engineering department can design wire holders for multiple start threads, helical gears, worms, and other special thread measurement applications. Our gage department manufactures some of the finest fixed limit gaging in the world. Some of our equipment includes CNC lathes (up to 34" diameter), CNC milling centers, I.D./O.D. thread and plain grinders, centerless, angle and surface grinders.